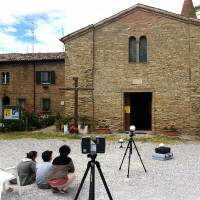 This paper will describe the research and teaching project Archaeology of architecture in Romagna where advanced archaeological survey methodologies have been used to investigate the history of monuments and their architectural evolution over time. We selected 46 sites, including 6 ecclesiastical buildings and 40 castles. 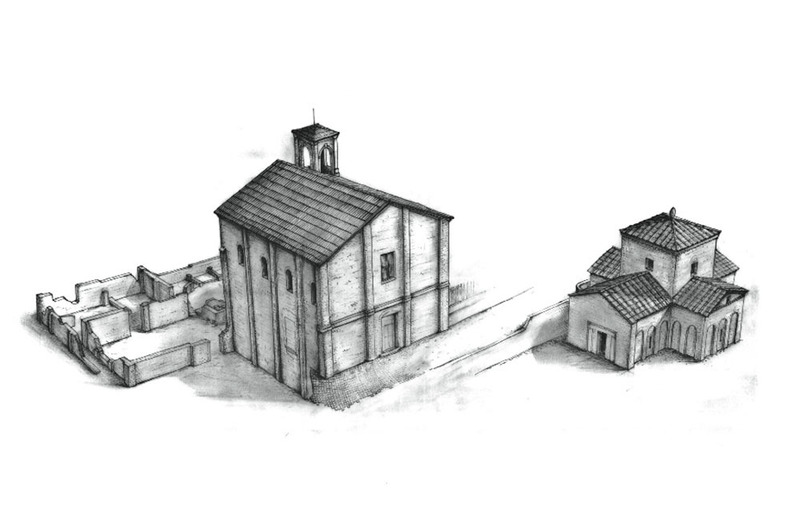 In the urban landscape the research focused on the church of Santa Croce in Ravenna. The study of the castles of Romagna, and the analysis of building techniques utilised within them, allows us to make observations regarding skills used in the construction of these buildings. Teaching activities have been conducted since 2008 as part of the workshop program of the Department of History, Cultures, and Civilizations. The most recent was carried out in Longana, near Ravenna, in the church of S. Apollinare. This paper aims to describe the research project ‘Archaeology of Architecture in Romagna’ and will present a preliminary report of teaching activities conducted since 2008 and a report on research undertaken during the last academic year. In the first part of this presentation, the research aims will be described as well as the results obtained so far in particular in the study of medieval churches and castles. Besides the research goals, this project also includes training objectives as well. In fact, this is a project that aims to combine academics and research creating concrete opportunities for the training of some archeology students of the University of Bologna. Starting in 2008, the field research has since involved hundreds of students and 8 archeological sites. For this reason, in the second part of this presentation, as an example of these important learning experiences, a preliminary feedback has been given about the most most recent learning lab held in Longana (near Ravenna) as part of the investigations of the church of S. Apollinare. The research objective of the Archaeology of architecture in Romagna is to apply advanced archaeological survey methodology to the investigation of the history of monuments and their architectural evolution over time to better understand the transformations of settlements – both urban and rural – and long term changes in material culture . The research results will also be used to guide the restoration and consolidation of the monuments as part of a heritage landscape. We selected 46 sites, including 6 ecclesiastical buildings and 40 defensive buildings (castles). Forty-four of these sites – 4 ecclesiastical buildings and 40 defensive buildings – had already been studied in a previous season (fig. 1). The site selection was determined by the presence of architectural characteristics in the buildings that would allow for the reconstruction of their architectural history from their foundation to the most recent transformation. Therefore, we primarily selected buildings without a history of restoration and with good stratigraphic articulation, showing architectural elements with established chronological indicators (i.e. decorations, doors and windows); this applies also to the selected castles, which exhibit multiple building techniques even in ruined structures. The site selection was based on research results published in Evaluation of Archaeological Potential (Augenti 2006, 88-89). First we collected all the published documentation. 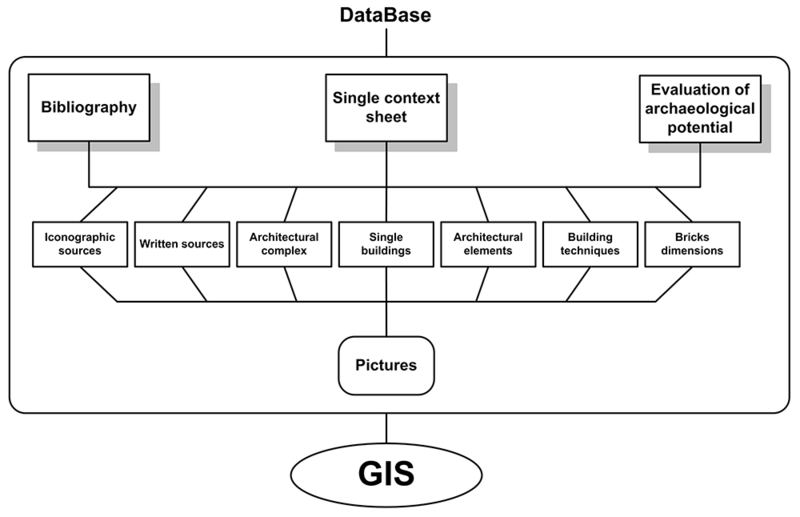 Finally, the collected data was stored in a table of our database and described in three sections: the first one contains geographical contexts; the second evaluates the architectural preservation of the site (i.e. quality of previous restoration if any, presence of medieval stratigraphy, visibility of archaeological relationships, etc. ); the last section collects all the historical information and previous archaeological research. 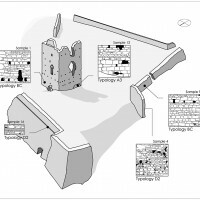 This “research model” was developed as part of a previous study on medieval castles in Emilia-Romagna lead by Prof. Andrea Augenti (University of Bologna) and Prof. Sauro Gelichi (University of Venice) . After a preliminary investigation it was possible to create a selection of sites that represent a good case study. 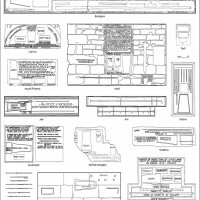 The study of a site consists in documenting the following aspects: 1) Compositional Units, known as Unità di Riferimento (Reference Units, consisting of architectural complexes, buildings, walls, horizontal surfaces and single architectural elements); 2) the stratigraphic composition of buildings; 3) building techniques of walls, doors, windows and decorations (fig. 2); 4) units of measurements applied during the planning and building phases. This approach is accompanied by the analysis of building materials and lithological characteristics of the rocks emerging on site. Documentation of these characteristics is carried out using the following instruments: single context recording sheets (written on paper or on a digital support tool such as a tablet); a total station for dimensional surveys and cross sections; a water level for horizontal and vertical axis control; a reflex digital camera and an aluminium telescopic pole for photogrammetric surveys (Fiorini 2012a). Recently, we have tested survey instruments with higher performance capabilities, such as 3D laser scanners and motorized total stations (able to perform automatic point measurements). 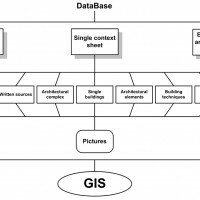 Field data and preliminary research data are managed by a database (Microsoft Access) and a Geographical Information System (Esri ArcGIS) (fig. 3). In the urban landscape, the research focused on one of the most significant ecclesiastical buildings in Ravenna: the church of Santa Croce (fig. 4). Today Santa Croce is a protected archaeological site due to its poor state of preservation. Its history is closely related to the Mausoleum of Galla Placidia. 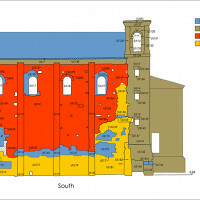 The 2008-2011 research seasons developed new interpretations about the original condition of the church and its architectural evolution (David 2013). Our new architectural survey - performed with a total station and photogrammetry - and new stratigraphic analysis has allowed for the reinterpretation of these earlier studies and documentation (fig. 5). 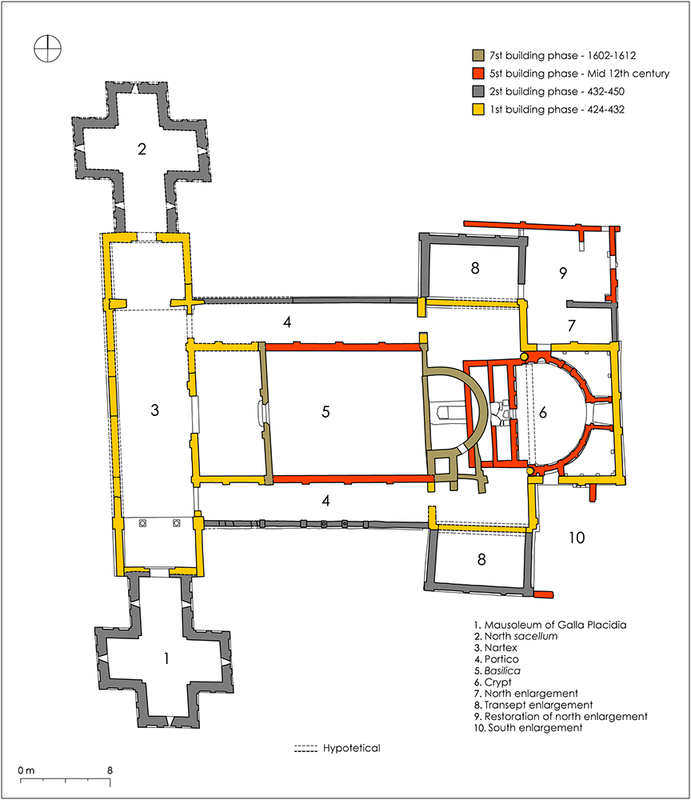 The original dimensions of the architectural complex were larger than the current ones and the ground plan corresponded to a Latin cross (Phase I: a. D. 424-432). Later, a martyria (known as Mausoleum of Galla Placidia) was added on the atrium (Phase II: a. D. 432-450) (fig. 6). The original facade exhibited a higher degree of artistry and the road that now separates it from the mausoleum did not exist in ancient times. The side walls were almost completely rebuilt during the 12th century, without dramatically modifying their dimensions (fig. 7). The current condition of Santa Croce results from a 17th century demolition and restoration activities at which time the road was built (Phase VII: a. D. 1602-1612). 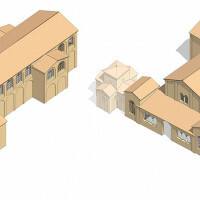 Our research allowed for a new archaeological project that improved the connection between Santa Croce and the Mausoleum of Galla Placidia, including the demolition of the 17th century wall that separates the church from the archaeological area of San Vitale, where now Galla Placidia is located. The success of our research has prompted ongoing archaeological investigation of suburban monuments, such as the parish church of S. Apollinare in Longana (Ravenna) and the chapel of S. Bartolomeo Apostolo in Tipano (Cesena) (Fiorini, Archetti 2011). Our research then turned to an analysis of the defensive structures. Our examination of the building techniques (fig. 8) utilized in the construction of Romagna castles has expanded current scholarly understanding of the range of crafts-people employed on these projects. Castle construction primarily employed bricklayers and stonemasons rather than stonecutters who were more expensive and slower (6-8 hours of work for one ashlar-squared stone block). In fact, in all of the castles examined, the building material most frequently used was uncut stone (or at most just broken into smaller pieces). Much less frequently used were roughly cut stones and square stones were even rarer. The reason why highly specialized stone-workers were relatively absent is mainly due to the geology of the area, mostly consisting of marlstone and sandstone. These types of layered stone can be very easily cut allowing for a production of blocks, basically “ready to use,” without any additional finishing process. The building materials were mainly from the surrounding areas unless the customer commissioned and paid for the prospection, quarrying and transport of more resistant imported stones. An analysis of several decorative typologies taken from different sites clearly showed that the building materials coming from the properties of wealthy families, such as the Malatesta, are more consistent. 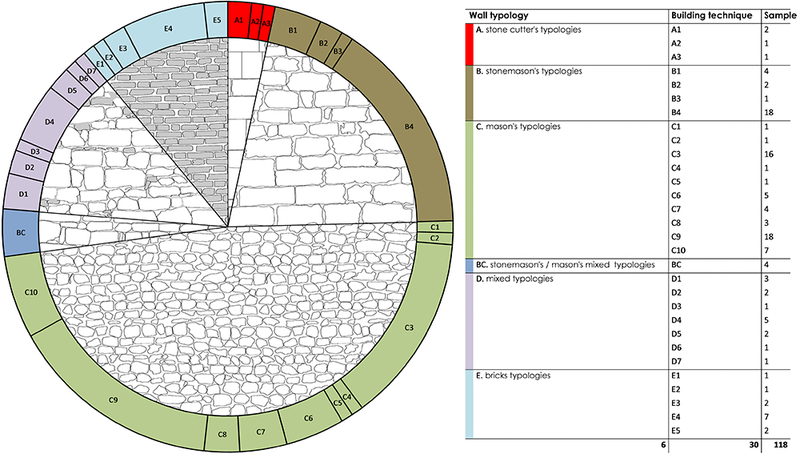 These types and characteristics present strong chronological indicators for the samples we have considered and can also be applied to a wider research area (Augenti et al. 2010; Augenti et al. 2009; Fiorini 2012b; Fiorini 2010). For the castles of the Romagna region, we found a specific evolution already documented in other historic Italian areas: Late-Medieval castles were commonly built on the sites of previously occurring High-Medieval castrum, showing expansion and embellishment over time, gradually evolving into the more comfortable rural villas. A good example of this evolutionary process exists at the Castle of Sorrivoli (Roncofreddo, FC), our first complete case study (Fiorini 2011). Comparative examination of structures in a range of other regions vastly supplemented our information on the settlements in Romagna through analogy: the castle in Monte Lucio (Quattro Castella, RE); the Castle of Zena (Carpaneto Piacentino, PC) (Augenti et al. 2012; Fabbri et al. 2009); and the Castle of Carbonana (Gubbio, PG), which represents the first case study of a medieval castle investigated using the archaeology of architecture model in the Umbria region. 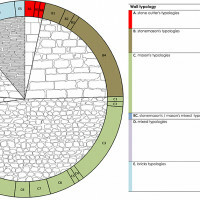 As part of this study, a research project was developed in order to carry out a census of the building material samples and samples of the units of measurement of Northern Central Italy (13th-18th centuries) (fig. 9) (Fiorini 2012b, 97-98). In medieval Italian communes, craftsmen and traders had to follow many rules to ensure the honesty and regularity of the trades. All the members within the same administrative district had to use the same systems of linear measurements and weights. Samples of these were displayed on the walls of public buildings (Riva 1978, 30; Venturi 1986, 34). The first step, before construction began, consisted in drawing the overall plan of the building on the ground, using ropes and knots at regular intervals, which had to align with the chosen measurement unit (Brogiolo, Cagnana 2012, 126-133). The metrological approach for the study of a monument uses the ancient measurements in order to understand the identity of clients, the origin of the workers and the chronology of architectures (Di Grazia 1991, 103-105; Docci, Maestri 1994, 155-168; Docci, Maestri 1984, 171-175; Fiorani 2004, 48-49; Ghiretti, Ottoni 2009; Luschi 2006, 2005; Salvatori 2006; Zupko 1997). This line of research considered a total of 36 examples: 1 library, 2 castles, 4 churches, 2 loggias, 1 museum. 22 palaces, 1 door, and 3 towers. We recorded up to 116 units of measurement, 90 types of building materials, 6 bricks types and 14 items not pertinent to the constructions. 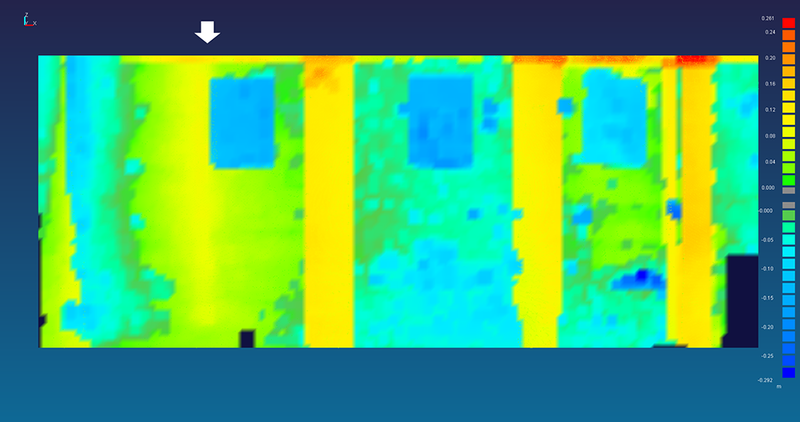 Most of these elements are located on the outer walls of the medieval buildings and were documented using photogrammetric techniques. According to our constructional indicators, we recognized six different medieval measurement shapes: A) wooden bar; B) metal bar; C) bas relief; D) linear engraving; E) linear engraving defined with metal bars; F) defined form with metal bars. The same concept could be applied to building material samples: A) metal bar; B) bas relief; C) engraved form; D) linear engraving. The brick moulds were usually created using wood or metal. The most common ones are the roof tile (coppo), the megianella, the tavella, the quadro, the quadrello and the quadrelletto (especially in Rimini). Very often these architectonic elements were displayed in special stones together with the measurement units described above. We also recorded tailoring units (namely marzaro), for masonry purposes and carpenters (namely marangone). Unfortunately it is not easy to pinpoint a chronology for all of these elements due to an absence of specific dates recorded on the stones (in less than fifty percent of artifacts). The most ancient examples discovered thus far are from Atri and Bologna, dating to before the 13th century. Only one in San Marino dates back to earlier than the 14th century and all the others range chronologically between the 15th and 17th centuries. The metrological approach enabled a range of interpretations and analyses. At the site of Castelnuovo (Meldola, FC), our analysis confirmed scholarly historical theories about the construction of the fortified tower. 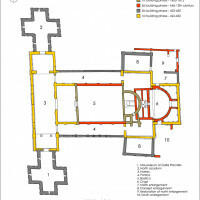 The architect in charge of the reconstruction of the tower was strongly connected to the ecclesiastical environment, and the units of measurement that he employed archaeologically demonstrate this connection. Units like canna, braccio and palmo d’ara, were traditionally used in Rome and in all the territories under its political control (Martini 1883, 596; Docci, Maestri 1984, 189-190, n. 15). At the site of Sorrivoli (Roncofreddo, FC) metrology confirmed the chronology described in ancient documents and archaeological sources. In the late 14th century the castle was taken over by the Malatesta family who subsequently built a tower using units corresponding to the 15th century braccio of Malatestian Cesena. For example, the wall thickness on the ground floor is 3 braccia (1.72 m), the diagonal of the ground plan (N-E) is 19 braccia (10.62 m) and the total height is exactly 33.5 braccia (18.11 m) (Fiorini 2011, 63-66). 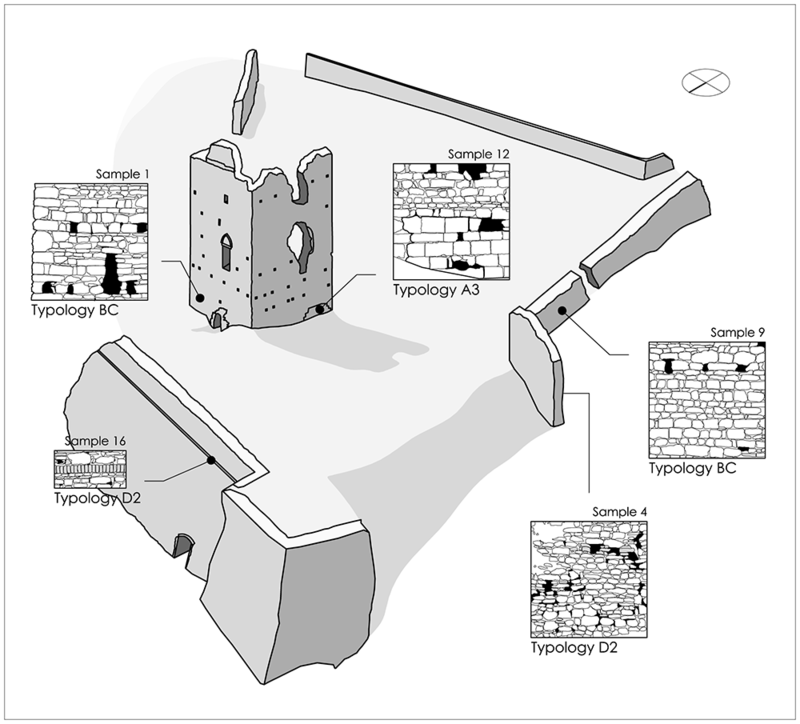 The metrological examination at Carbonana (Gubbio, PG) castle offers similar conclusions: the chronology of the architectural complex matches the information found in the written documents. We also found information on stonemasons (fig. 10). 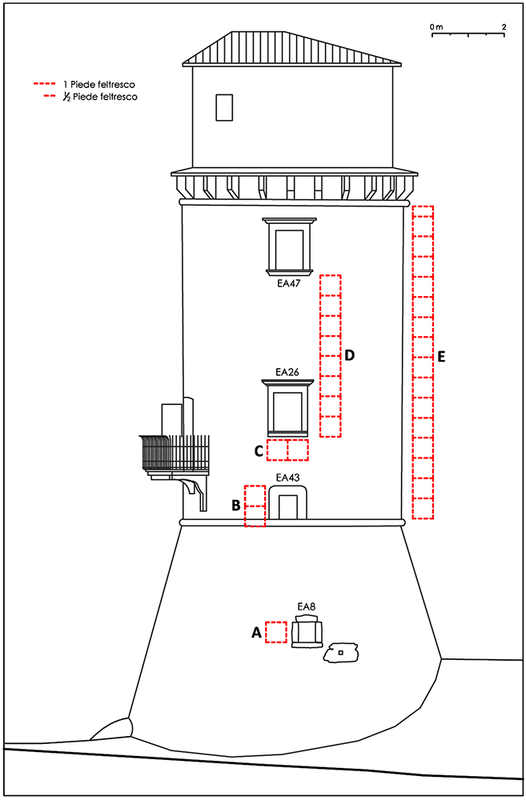 Nevertheless, Carbonana also revealed the limits of this methodological approach, especially in the castle tower, where we identified a measurement unit called piede feltresco which was only used during the 15th century, about 200 years after the construction of the tower (fig. 11). This may result from an error during the construction process or an unusual coincidence. Beyond research activities, the project Archaeology of architecture in Romagna is also a teaching tool for the students of the University of Bologna. Since 2008 the Laboratory of Archaeology Architecture has been an important part of the educational opportunity in the Dept. of History, Cultures and Civilizations. Through lectures and practical activities, students learn how to investigate historical architecture. 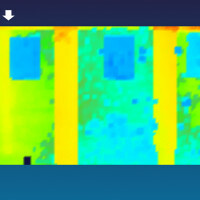 2D and 3D survey techniques. At the end of the Laboratory activities, each student writes a report about his or her experiences. Alongside evaluations of theoretical and practical knowledge gained through the course, this individual report is an important gauge of their ability to synthesize the theory with practical application. At fifty hours in length, the course program cannot address all archaeological topics and research questions; however, it does allow the student to develop a skill-set that will facilitate their in depth examination of a research topic for a final dissertation. In this way, the laboratory is an important instrument, simultaneously furthering departmental contributions to the discipline and training new students with the tool set required to complete their own studies. Since 2008, we have supervised 11 undergraduate and postgraduate dissertations, some of which have become scientific papers or monographs. Among them, worth mentioning are the study on the church of S. Croce (Ravenna) and the castle in Sorrivoli (Roncofreddo, FC). In these two cases, the field work done by the students was important because it made a valid contribution to the research. Since 2008, field schools have been carried out in 8 archaeological sites, involving a total of 121 students. The sites investigated include the castles in Sorrivoli (Roncofreddo, FC) and in Teodorano (Meldola, FC) in 2007/2008; the castle in Monte Battaglia (Casola Valsenio, RA) in 2008/2009; the fortress of Predappio (FC) in 2009/2010; the tower of Montalto (Premilquore, FC) in 2010/2011; the village of Valdinoce (Meldola, FC) in 2012/2013; and the parish church of S. Apollinare in Longana (RA) in 2013/2014. The most recent training in the Archaeology of Architecture took place in Longana (RA) at the church of S. Apollinare (fig. 12). This ecclesiastical building is part of a large architectural complex (about 430 sq. m) that sits on a plain, ca. 6 meters above sea level, close to Ravegnana road (115 m) and the Ronco river (150 m). It has a rectangular ground plan (8.6 x 16.9 m). The S-E wall presents the modern facade but in ancient times it was the opposite one. In the north corner there is a bell tower with a square ground plan (2.4 x 2.7 m). Both the church and the bell tower were built with reused bricks. 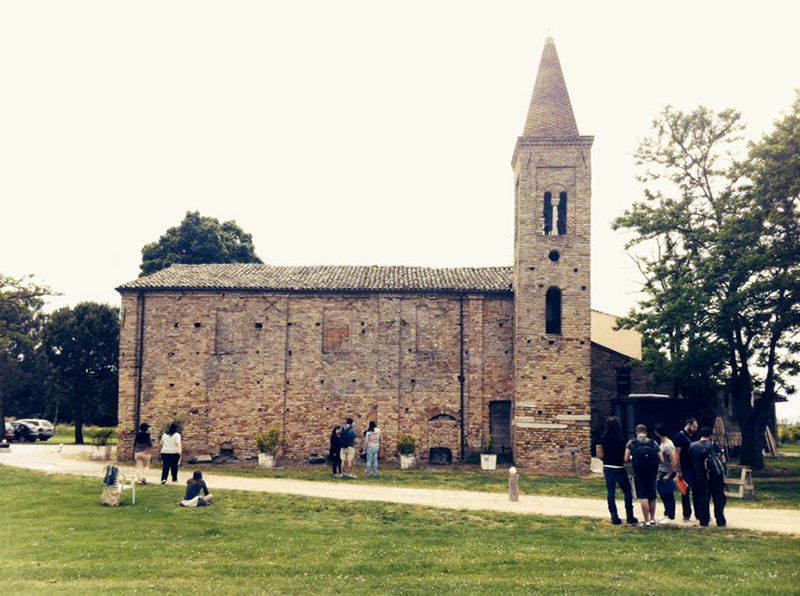 S. Apollinare parish church is a building with high archaeological potential. Its first mention in a written source dates to the 11th century. 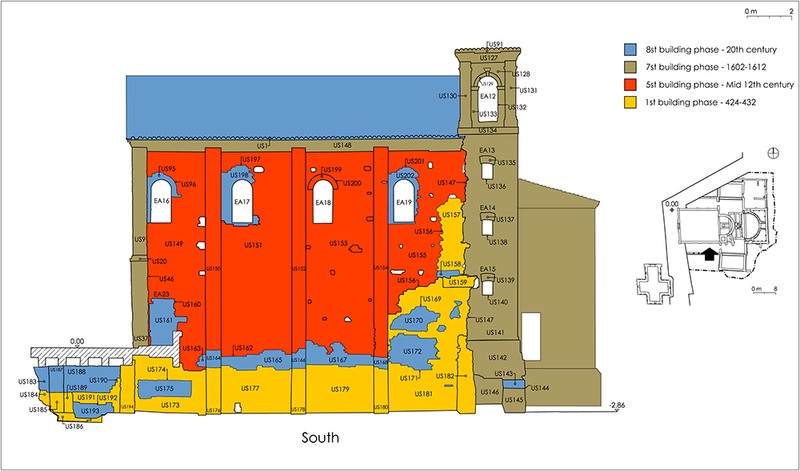 Archaeological stratigraphy around the church is so well preserved that excavation and geophysical investigations have been planned. 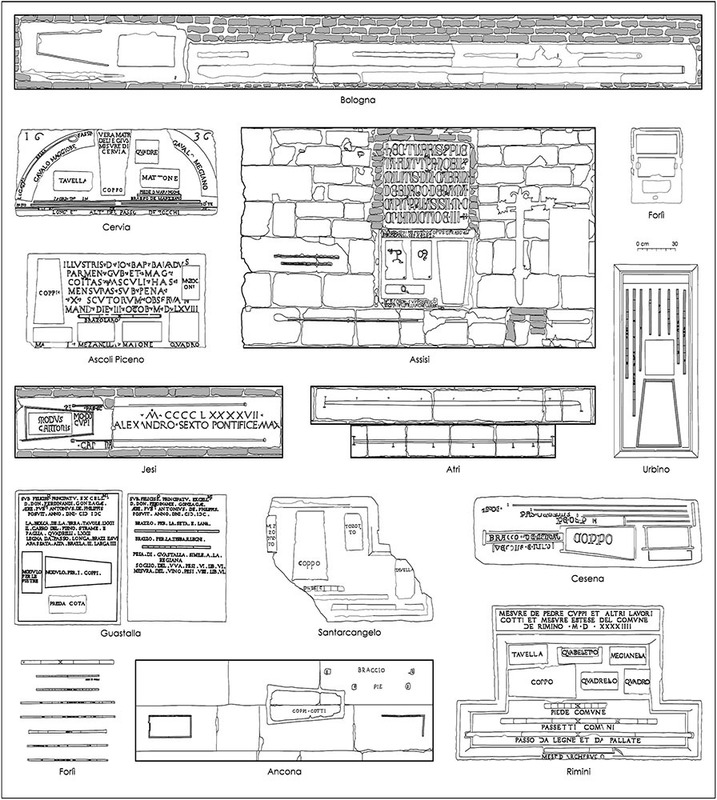 The exterior walls exhibit an elaborate stratigraphic articulation and some elements have reliable chronology. Our ongoing research objective at this site is to reconstruct the evolution of the building construction from its earliest phase to its most recent and to analyse the different building techniques in each consecutive building phase. The results will expand scholarly knowledge of several historical problems (e.g. the ecclesiastical organization of rural areas near Ravenna and the distribution of different architectonic typologies in the landscape) and will guide future restorations. Following a specific workflow, damages and structural deformations have been recorded producing a map of preservation that will also be used for future technical evaluations of the seismic risk. direct surveys for other specific goals, such as definition of ancient measurement units and integration of gaps in photogrammetric and laser scanning graphic documentation. 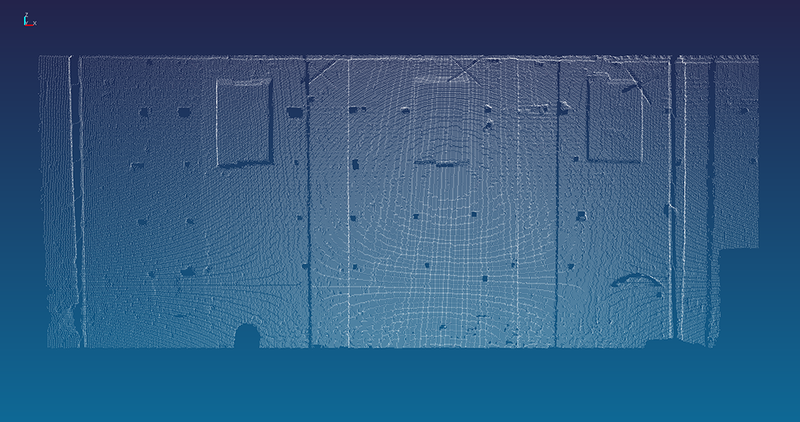 In this paper I would like to express some opinions about 3D laser scanning. The Department of History, Cultures and Civilizations owns a FARO Focus 3D S 120 produced and sold by CAM2 that was used in this research. Its direct application in the field highlighted its strengths and weaknesses. The FARO Focus 3D is highly accessible – it is easy to use and easily portable. Artificial targets (checkerboards and white spheres) were positioned along the area and used during the post-processing to combine the different scans, as they are automatically recognized by the software. For optimal results the correct parameters for scanning resolution and registration quality must be set. Increasing these parameters generates a better representation of targets but also a much longer scanning time. 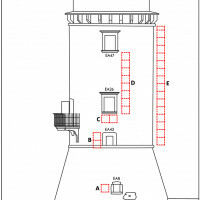 Restricting the target scan area solves this problem, for example, it was possible to use the basic settings of the instrument (vertical angle from 90° to -60°; horizontal angle from 0° to 360°) only inside the church. Increasing the visibility of the spheres by placing a black frame behind them was also successful and improved the process of identifying the targets in the point cloud. Some problems developed with the automatic project composition when targets were placed at a distance of over 15 meters (settings: 1/5 of maximum resolution, maximum quality) or 25 meters (1/4 of maximum resolution, 6x quality). At distances under 10 meters, using the same settings (1/4 of maximum resolution, 6x quality), scanning encountered no problems with automatic project composition. The instrument was placed in 7 different positions in order to detect all the surfaces in the monument. After that, using the software SCENE 5.2 64bit, it was possible to automatically create ground plans and cross sections from the point cloud. To create elevation views including any anomalies (e.g. non-straight walls and structural deformations) we used a different setting: the instrument was placed directly in front of the scan target and the main scanning parameters, quality and resolution, were increased (fig. 14). Documenting the structural anomalies, we compared the actual architectural plan of the walls overlapping an ideal plane: the distance of the single points from this plane produce a coloured map of deformations, clearly visible when comparing the data to the straight vertical plan. In the same way, walls that present bulges have been documented using an interpolate plan, which will represent the original outlines of the walls without deformations (fig. 15). Fig. 1. Map of the 46 selected sites. Defensive Buildings: 1. Fort of Monte Poggiolo; 2. Castelnuovo; 3. Albicini Tower; 4. Castellaccio di Fornazzano; 5. Tower of Ceparano; 6. Bonini Tower; 7. Castle of Pianetto; 8. Mirone Tower; 9. Fortress of Elmici; 10. Castellaccio di Corniolino; 11. Giaggiolo; 12. Castle in Sorrivoli; 13. Teodorano; 14. La Roccaccia di Modigliana; 15. San Cassiano; 16. Rondinaia Tower; 17. Tower of Monte Erno; 18. Castle of Torriana; 19. Madonna di Saiano; 20. San Giovanni in Galilea; 21. Malatestian Fortress of Montefiore Conca; 22. Malatestian Fortress of Verucchio; 23. Tower of Montalto; 24. Monte Mauro; 25. Fort of Pondo; 26. Castle of Santa Fiora; 27. Tower of Cerro; 28. Castellaccio della Pietra; 29. Predappio; 30. Malatestian Fortress of Spinello; 31. Fort of Corzano; 32. Castle in San Martino in Gattara; 33. Dovadola; 51. Monte Battaglia; 65. Fort of Caminate; 105. Tower of Marino; 140. Pratesi Tower; 142. Particeto; 144. Tower of Valdoppio; 147. Monte Vecchio. Ecclesiastic Buildings: 172. Parish church of Sant'Apollinare in Longana; 173. Bell Tower in San Severo; 174. Episcopio; 175. Church of San Bartolomeo Apostolo; 176. Church of Santa Croce; 177. 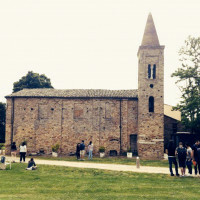 Parish church of Sant'Andrea in Panicale. Fig. 2. 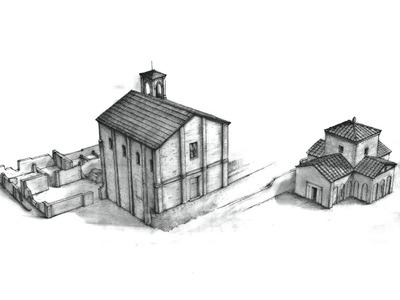 Different building techniques from the site of Castelnuovo (Meldola, FC). Fig. 3. Structure of Data Management. Fig. 4. Ravenna, architectonic complex of S. Croce. Drawing of the current status of the site (from David 2013, 6). Fig. 5. Ravenna, architectonic complex of S. Croce. Hypothetical reconstruction of the first two phases (from David 2013, 148-149, pl. 4-5). Fig. 6. Ravenna, architectonic complex of S. Croce. Overall plan indicating the different phases of the buildings (from David 2013, 152, pl. 8). Fig. 7. Ravenna, architectonic complex of S. Croce. Elevation view of the southern side of the complex representing the whole stratigraphy of the architectures (from David 2013, 153, pl. 9). Fig. 8. Chart of the different building techniques recorded among the castles of Romagna area. Fig. 9. Series of shapes of ancient architectonic materials and metric units from center-north Italy (survey A. Fiorini, V. Archetti). Fig. 10. Castle of Carbonana (Gubbio, PG). Schema of the identification of two ancient units of measurement (elaboration A. Fiorini; survey D. Ripa di Meana, B. Salvatici). Fig. 11. Castle in Carbonana (Gubbio, PG). Schema of the identification of two ancient units of measurement (elaboration A. Fiorini; survey D. Ripa di Meana, B. Salvatici). 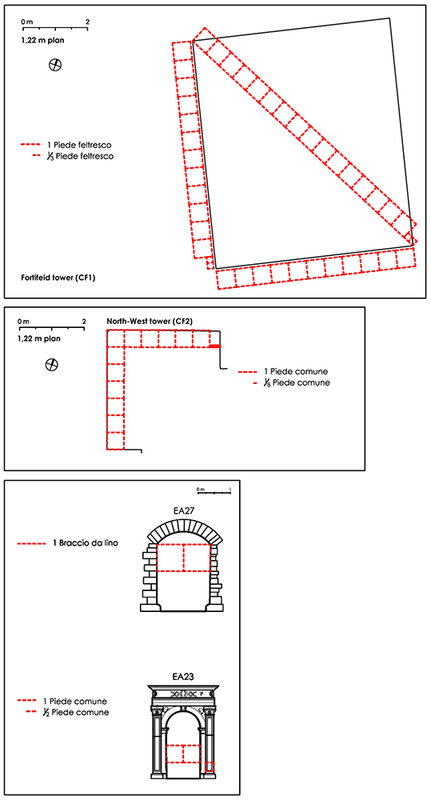 Above, the ground plan of the fortified tower. Fig. 12. Parish church of S. Apollinare in Longana (Ravenna). Students during the field work. Fig. 13. Parish church of S. Apollinare in Longana (Ravenna). 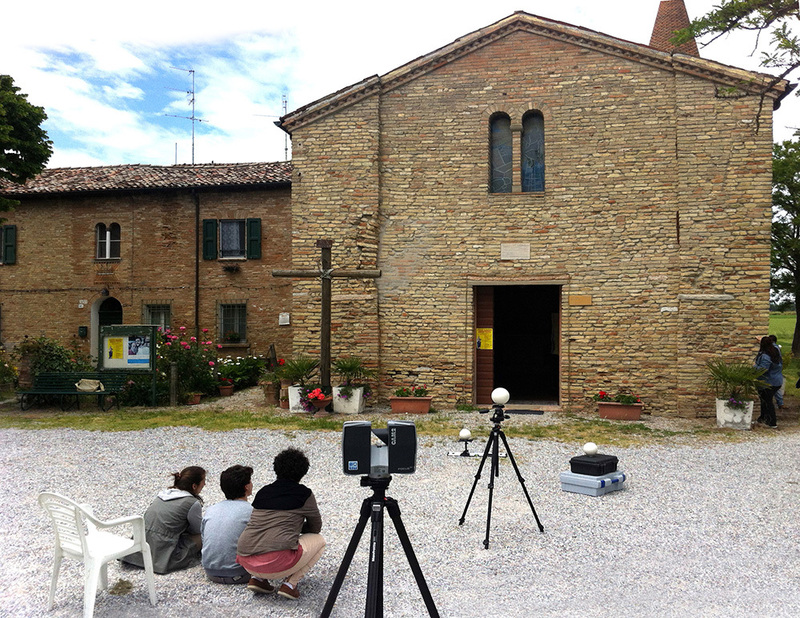 Students during an acquisition with the FARO laser scanner. Fig. 14. Parish church of S. Apollinare in Longana (Ravenna). 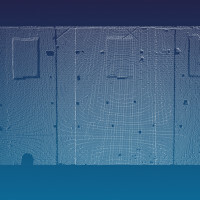 Point cloud produced by the FARO Laser Scanner. Fig. 15. Parish church of S. Apollinare in Longana (Ravenna). North-East wall. Map of deformations create by the interpolation between the scanned data and an cross-plane. The arrow highlights a bulge due to the gap between the left portion (recently added) and the original church. Augenti, Andrea. 2006. “Archeologia dei castelli della Romagna: linee programmatiche di un’indagine in corso.” In Castelli medievali e neomedievali in Emilia-Romagna, Atti della giornata di studio (Bologna, 17 marzo 2005), edited by M. G. Muzzarelli and A. Campanini, 75-93. Bologna: CLUEB. Augenti, Andrea, Enrico Cirelli, Andrea Fiorini and Enrico Ravaioli. 2009. “L’incastellamento in Romagna: indagini 2006-2008.” In V Congresso Nazionale di Archeologia Medievale (Palazzo della Dogana, Salone del Tribunale, Foggia; Palazzo dei Celestii, Auditorium, Manfredonia; 30 settembre-3 ottobre 2009), edited by P. Favia and G. Volpe, 341-348. Firenze: All’Insegna del Giglio. ———. 2010. “Insediamenti e organizzazione del territorio in Romagna (secoli X-XIV).” Archeologia Medievale 37:61-92. Augenti, Andrea, Andrea Fiorini, Paola Galetti, Nicola Mancassola and Giorgia Musina 2012. “Scavo di Monte Lucio, Quattro Castella (Reggio Emilia).” In VI Congresso Nazionale di Archeologia Medievale (Sala Conferenze “E. Sericchi”, Centro Direzionale CARISPAQ “Strinella 88”, L’Aquila, 12-15 settembre 2012), edited by F. Redi and A. Forgione, 233-237. Firenze: All’Insegna del Giglio. Brogiolo, Gian Pietro and Aurora Cagnana. 2012. Archeologia dell’architettura - metodi e interpretazioni. Firenze: All’Insegna del Giglio. David, Massimiliano. Ed. 2013. La basilica di Santa Croce. Nuovi contributi per Ravenna tardoantica. Ravenna: Edizioni del Girasole. Di Grazia, Vincenzo 1991. Rilievo e disegno nell’archeologia e nell’architettura. Tecniche, opinioni e teorie. Roma: Kappa. Docci, Mario and Diego Maestri. 1994. 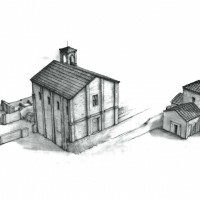 Manuale di rilevamento architettonico e urbano. Roma-Bari: Laterza. ———. 1984. Il rilevamento architettonico. Storia, metodi e disegno. Roma-Bari: Laterza. Fabbri, B., Andrea Fiorini and Sabrina Gualtieri. 2009. “Il castello di Zena (PC): storia, archeologia e archeometria.” Archeologia dell’Architettura 14:45-62. Fiorani, Donatella. 2004. Restauro architettonico e strumento informatico. Guida agli elaborati grafici. Napoli: Liguori. Fiorini, Andrea 2012a. “Tablet PC, fotogrammetria e PDF 3D: strumenti per documentare l’archeologia.” In Documentare l'archeologia 2.0, Atti del Workshop (Bologna, Alma Mater Studiorum Università di Bologna, 19 aprile 2012), edited by A. Curci and A. Fiorini, Archeologia e Calcolatori 23:213-227. ———. 2012b. “I castelli della Romagna: materiali costruttivi, elementi architettonici e progettazione.” In VI Congresso Nazionale di Archeologia Medievale (Sala Conferenze “E. Sericchi”, Centro Direzionale CARISPAQ “Strinella 88”, L’Aquila, 12-15 settembre 2012), edited by F. Redi and A. Forgione, 93-99. Firenze: All’Insegna del Giglio. ———. Ed. 2011. Il castello di Sorrivoli (Roncofreddo, Forlì-Cesena). Storia e archeologia dell’architettura. Bologna: Ante Quem. ———. 2010. Archeologia dell’architettura in Romagna: progetto per la realizzazione di un atlante delle tecniche costruttive di età medievale, Università di Bologna, Tesi di Dottorato di Ricerca in Archeologia, XXII ciclo. Fiorini, Andrea and Valentina Archetti. 2011. “Fotomodellazione e stereofotogrammetria per la creazione di modelli stratigrafici in archeologia dell’architettura.” Archeologia e Calcolatori 22: 199-216. Ghiretti, Andrea and Federica Ottoni. 2009. “Analisi grafica e metrologia.” In Santa Maria del Quartiere in Parma. Storia, rilievo e stabilità di una fabbrica farnesiana, edited by P. Giandebiaggi, C. Mambriani and F. Ottoni, 174-185. Parma: Grafiche Step. Giorgi, Enrico. Ed. 2009. Groma 2. In profondità senza scavare. Bologna: BraDypUS. Luschi, Cecilia Maria Roberta. 2006. 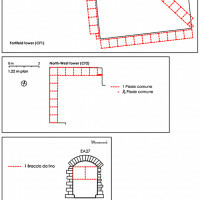 “Le misure dei castelli: il caso di Prato, le verifiche di Manfredonia e la riconoscibilità di una matrice geometrico compositiva nella pieve castello di Stazzema.” In Le misure del castello. Un percorso per la conoscenza dell’architettura fortificata, Atti del convegno nazionale di studi castellologici (13-14 ottobre 2006), edited by F. Manenti Valli, 32-38. Roma: Istituto italiano dei castelli. ———. 2005. “La relazione tra teoria e pratica nell'architettura federiciana.” In Il castello di Prato. Strategie per un insediamento medioevale, edited by M. Bini, C.M.R. Luschi, A. Bacci, 35-48. Firenze: Alinea. Martini, Angelo. 1883. Manuale di metrologia. Ossia misure, pesi e monete in uso attualmente e anticamente presso tutti i popoli. Torino: E. Loescher. Riva, Claudio. 1978. Cesena intorno alla metà del Quattrocento (Note di vita sociale dai bandi del Comune). Forlì: Camera di Commercio, Industria, Artigianato e Agricoltura. Salvatori, Marcello. 2006. Manuale di metrologia. Per architetti studiosi di storia dell’architettura ed archeologi. Napoli: Liguori. Venturi, S. 1986. “L’età del Comune e del mattone.” In Città ancór di mattoni: idee per un museo, edited by M. Foschi and O. Piraccini, 33-37. Forlì. Zupko, R.E. 1997. “Metrologia architettonica.” In Enciclopedia dell’Arte Medievale. VIII, 354-357. Roma: Istituto della Enciclopedia italiana. 1. The research project was supported by the Istituto per i Beni Artistici e Culturali of the Region Emilia-Romagna (Institute for Cultural Heritage) and the University of Bologna – Dept. of Medieval Studies and Dept. of Archaeology, now combined in the new Dept. of History, Cultures and Civilizations. The archaeological investigation project was overseen by the University of Bologna and the University of Venice. For a presentation of the research methodology followed by the team of Romagna castles see Augenti 2006. 2. During this research project, updated survey and documentation systems were used: laser scanners; photogrammetry with the output of three-dimensional models; tablets and PC for managing data in the field; 3D PDFs for communicating the research results. For more information on these issues, please see: Fiorini, A. 2012a; Fiorini, A., Archetti, V. 2011. For a comparison with similar research and learning experiences carried out in the same context, please see for example Giorgi 2009. Andrea Fiorini 2016, ‘Archaeology of Standing Buildings: teaching and scientific activities’, in Groma 1. doi: 10.12977/groma6.